I was intrigued to read this book and it did not disappoint in terms the world that was developed to describe how these angels fell from heaven's grace. One of the things I found interesting was how the afterlife was presented in particular the realm that Allie found herself in, in between heaven and hell. Allie was a smart-mouthed, tough cookie who never seems to back down from a fight. With Raziel's negative attitude towards Allie it was like trying to put oil and water together and made me wonder how these two would end up with each other. Raziel tells himself he never wants to be involved with a human, to take on another mate and endure the pain of watching her die, thus when Allie comes along he finds that his body is less then willing to cooperate with his mind in resisting her. In the background of Allie and Raziel's love-hate relationship, Uriel is hellbent of destroying the Fallen and unleashing his form of justice. I found it interesting that a large portion of the book was spent with Allie and Raziel resisting each other which resulted with no sexual tension really developing between the two. 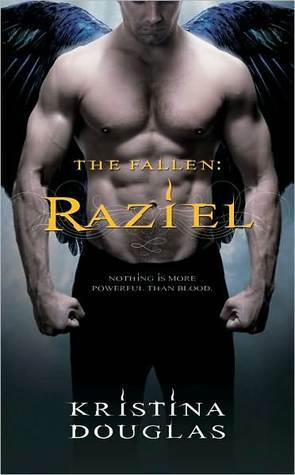 Yes, Raziel is a powerful, attractive, brooding alpha Fallen, but Allie doesn't focus on that, just fighting with him. The book was good, but after a while Allie got on my nerve. Raziel on the other hand I found to be a little cold and found it difficult to see a relationship developing between these unlikely two. The conflict between the two and how it was resolved was good though I would have loved to have seen more tender moments between Allie and Raziel. I liked Allie better than you did but Raziel was a bit annoying to me :) I love how different characters can cause different reactions in people. That is a sign of an excellent writer!